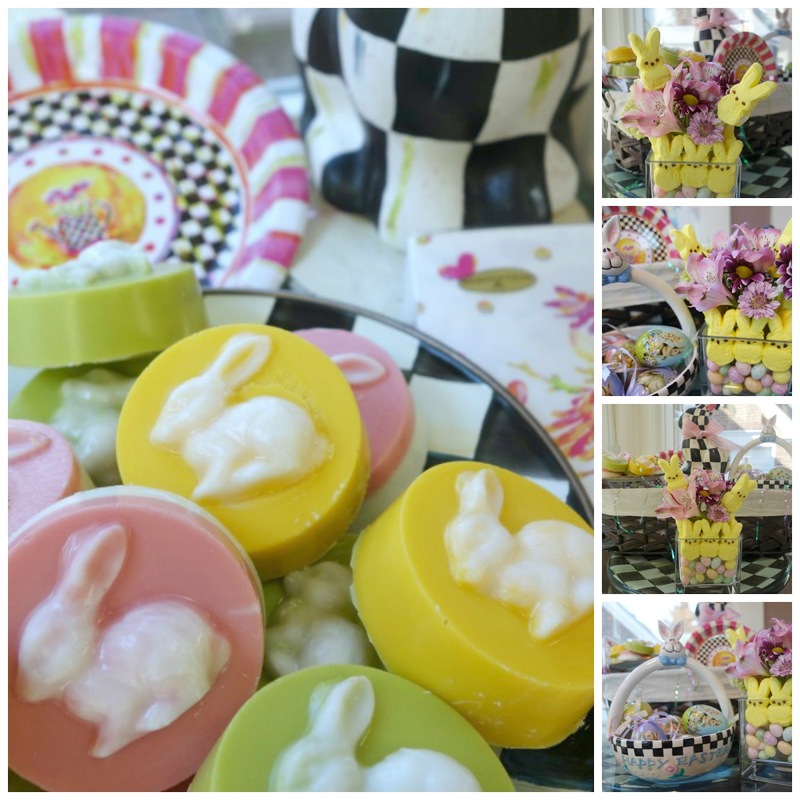 To make these darling bunny cookies, I ordered the six cavity plastic molds from Fancy Flours and made Covered Oreos for Easter. They work great! All you need is the mold, candy wafers (I found them on sale at JoAnn Fabrics for 50% off), a package of Oreo cookies and a craft brush. You can the directions on the Fancy Flours website. It's all about the bunnies this year for Easter so I hopped over to Taste of Home and found this adorable centerpiece. Place Peeps on top of jelly beans, making sure to save a few for the corners of the vase. Don't be afraid to squeeze them into the space. You should have enough to fill in any gaps. Happy Easter! Thank you for hopping by! I am joining Rattlebridge Farm for Foodie Friday. Congratulations, Debbie! Oh, what a little darling and I'm so happy for you. Yes, there is no other love like the love for a grandchild! I've been blessed two times now! Everything looks so sweet and festive! Happy Easter! There is such a feeling of joy in this post..you make a lovely grandma..your mom must be smiling down at you..so happy for you..love his name..and all your Easter preparations..Debbie they grow so fast..hold him every chance you get. Congrats on becoming grandparents! I don't know who looks more content, you orLittle Xavier...enjoy him as much as you can, they grow up too fast. You are so lucky he lives so close, Debbie! More opportunities to hug him. I see many more child-themed tables in your future :) What a sweetheart! Congratulations on the newest bundle of joy for your family! He's beautiful. Your entire post is a joy to see today. Love your hair too! Happy Easter to you and yours. 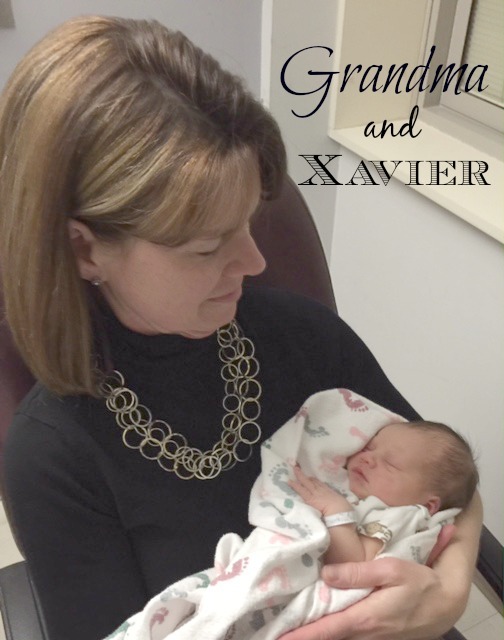 I know you're finding out the joys of being a grandma, Debbie, to your darling little Xavier. How lucky that they live so close by. Congrats Debbie that's so fun-enjoy every minute with the baby:@) Your bunny Oreo's turned out great-Happy Easter! How wonderful for you Debbie having this little bundle of joy come into the world and your life. Congratulations to the new parents too! Love the bunny cookies and centerpiece. Happy Easter! He is certainly a keeper, so sweet and cuddly!! The Oreos are Delish!!! YUM!!! Cute centerpiece and I also bought those paper goods - too cute!! Happy Easter!! Oh, I love seeing this photo of you and Xavier. What a special time! I would love to be cuddling that little one this Easter, or any day. This is going to be an especially happy one for you and your family. I love the pastel cookies, the MCK-C plates, and those photos of that cutie! Happy Days to each of you!